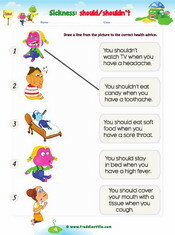 These ESL/EFL worksheets will help learners review health and sickness vocabulary. 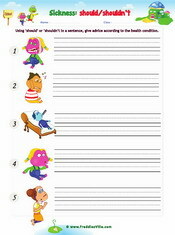 There are gap fill exercises, matching and writing worksheets. Sentences used include: I have a headache, I have a sore throat. Sentences used include: You should stay in bed, You shouldn't watch TV. 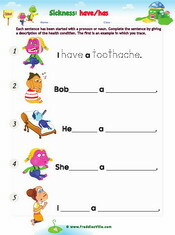 This worksheet provides writing practice especially when using modals 'should' and 'shouldn't' to give health advice.